Your genre updates are posted to last.fm, so you're not only fixing your own genres, you're also helping to improve genre quality for all other MusicCabinet users. Note: this release changes a CSS file. Some browsers (Firefox, Opera) caches them rather aggressively, so if the genre update view lacks color in your browser, open a new tab and go visit (yourhost:yourport)/style/sonic_white.css or (yourhost:yourport)/style/sonic_black.css to force reading them again. If you're already using MusicCabinet 0.7, you can just replace your subsonic.war with http://dilerium.se/musiccabinet/subsonic.war and stop/start Subsonic. New release available - 0.7.15. MusicCabinet is a tool built to help you find new music. So far, it has integrated knowledge from last.fm, to explore genres and similar artists. I've now added integration with another well respected source of information: http://musicbrainz.org/. The first task I'm interested in is this: which albums do you lack in your collection? Have your favorite artists released music you're not aware of? There's now a simple interface to help you retrieve information from MusicBrainz, store it in your Postgres database, and then search for missing albums. Just as last.fm, MusicBrainz has limitations on how fast we can retrieve information. Roughly, fetching discography will take at least 30 minutes per 1000 artists (only artists with full albums in your library are looked up). The information is considered valid for three months, so you will not get notifications of new albums, MusicBrainz does not support that. For huge libraries, information for max 3000 artists is fetched per update. You can access the search from the bottom of the left frame, as "Missing albums". This release also comes with a small fix: album names are now scrobbled to last.fm. There are now two types of Media Folders: indexed and non-indexed. Non-indexed folders are shown in the left frame, are never scanned and are browsed in file-based mode. Useful to make a temporary download folder available via the web interface. Option in personal settings to display all Various Artists albums in left column, below indexed artists, for quick access. Top tracks are now picked first from Albums/EPs/Singles, then from album with earliest release year, if you have multiple tracks with the same name on different albums. Top tracks now also take Album Artist into account. When adding loads of new albums, they're now sorted by file modification date in Recently Added view. Sorry, I introduced a bug for apps in 0.7.16 while refactoring some code. I've put up a new version (0.7.16b) that hopefully fixes this. It also adds an experimental feature I wrote yesterday: artist details. From the artist view, you can now click "Details" and get full artist biography, discography (if you've done the MusicBrainz update), and a top track list to help you learn a bit more and get to know what tracks and albums you're missing. Advanced search. 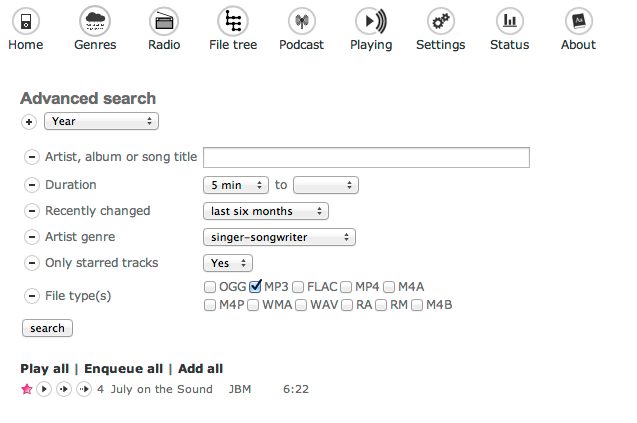 You can now combine different criteria when searching for tracks. You can switch to advanced search after doing a normal search, or directly by pressing the magnifying glass without entering any search text. Supported options: artist, album artist, composer, album, song title, track and disc number, year, track genre (taken from file tag), artist genre (taken from last.fm), duration, media folder, top track rank, starred filter, play count, file type, recently changed, recently played. Some searches may be a bit slow, depending on your library size and disk speed. All criteria are not indexed. Interface requests: Media folders are now sorted, and a small spacing is inserted between multi discs with correct disc and track numbers. TWO NEW THEMES! Please say thanks to sigel who've started working on a better looking interface for MusicCabinet. They are bundled as separate themes called MusicCabinet white/black. Very exciting! 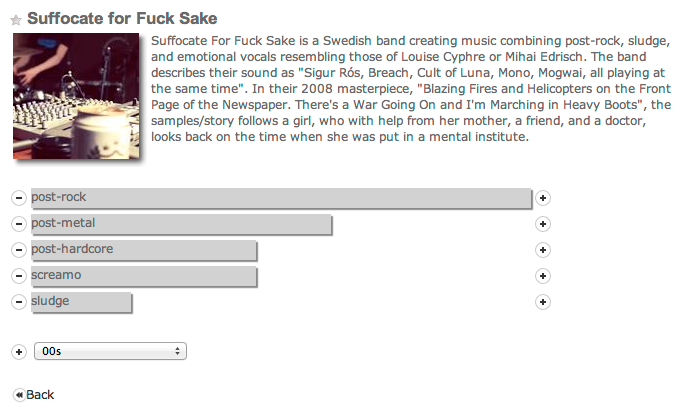 Thanks to draganshadow, it was brought to my attention that last.fm has changed format slightly for artist biographies. This has caused nightly imports to fail lately. Hopefully, this is fixed now. Run a normal scan after installing this to get your biographies. You can now choose whether to display Recently played, Most played and Starred items only for yourself, or for all users, in the personal settings. You can now specify song length interval for tracks be included in radio playlists, to avoid 30 sec intros or 20 minute tracks. Requires a normal scan to take effect, too. Fixes the Podcast page (downloaded episodes not being playable). New release, 0.7.21. No code written by me, only contributions from others! Be sure to leave thanks where appropriate. Sorry, screwed up the last release and I didn't find out as it only borked for people who haven't payed Sindre for a license. I've replaced 0.7.21 with 0.7.21b, download links are the same as usual, see previous post. The code is also up at Github. I hope this will work better. This is simply called 0.7.21c and download links are same as above. Thanks for contributing! Automatic (optional) sync of loved tracks at last.fm / starred tracks. Tracks that you star/unstar are immediately loved/unloved at last.fm. Loved tracks and previously starred tracks are synced during full scans. Option to choose which language to fetch artist biographies and tag info for. Note that biographies are not available in all languages for all artists, so using English will still give you the highest hit rate. For FLAC files, "Album Artist" tag is now also read during scanning (previously was only "AlbumArtist" read, it's more commonly used). This also requires removing your media folders, scanning, re-adding and scanning. Embedded lyrics are now exposed via the API for apps. Version 0.7.23 is now up on Github. News: MusicCabinet now reports itself as REST version 1.8.0, i.e the same as a Subsonic 4.7 server, instead of previously 4.6. The new methods added in 4.7 are implemented but not thoroughly tested (I built some auto-tests, and checked manually with Subwiji and iSub, didn't have my Android phone at home). Different clients use the API differently so I can't really guarantee anything without testing each client individually. Make backups of playlists before editing them to be safe! For those who feel like trying it: stop your service, replace your subsonic.war (or subsonic-main.war) with this: http://dilerium.se/musiccabinet/23/subsonic.war and start again. This also fixes the recent bug with empty top artists / recommended artists. Option to use artist genres from local library instead of what people have tagged artists as on last.fm. Example: if you have four files by an artist, 2 pop, 1 rock, and 1 untagged, that artist will be considered as 50% pop and 25% rock.